I once arrived in Córdoba on a fine day in October, to find it was a local holiday, the feast of San Rafael (October 24). The whole town closed up shop and headed for the hills for a midday cookout. The favorite dish for San Rafael day is perol de arroz, rice cooked, not in a flat paella pan, but in a deep two-handled frying pan, over a fire of thyme, rosemary, wild oak and olive. And, unlike paella, the perol contains no seafood, only meat such as rabbit, chicken, pork and sausage. 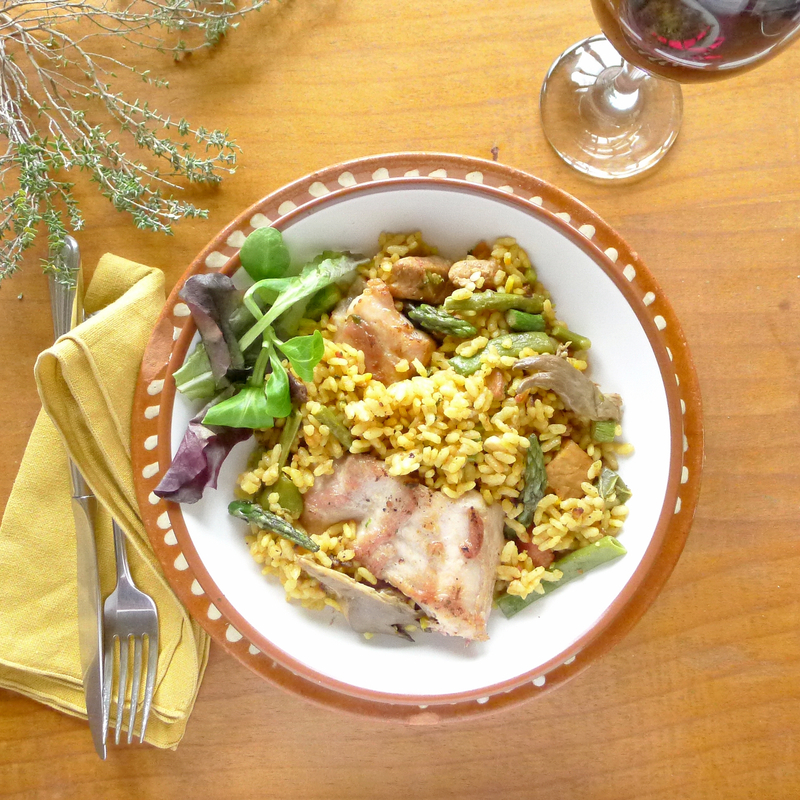 Family and friends gather round while the rice cooks, then everybody eats from the same pan—cucharón y paso atrás—spoonful and step back. The ruins of Medina Azahara, a Moorish palace, outside of Córdoba. In actuality, as urban areas have spread, the open campo, or countryside, is no longer an easy walk from town. 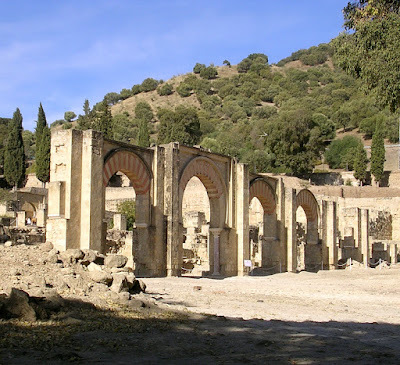 When I visited the ruins of Medina Azahara, a fabulous Moorish palace outside of Córdoba, I was amused to see signs posted in the adjoining fields: prohibido los peroles--“prohibited to cook rice in perol here,” because it was private property. Cook over a wood fire--or in the kitchen. I decided this would be a fine dish to serve my family and neighbors for Sunday lunch in my campo. Actually, I cooked it in the kitchen, not outdoors. Everybody enjoyed it—except the 11-year-old, who refused to eat the rabbit. He had been cavorting with bunnies just the day before and eating them was beyond the pale. Add any vegetables you like. Asparagus and mushrooms are usual ones. I used green beans as well as asparagus, because my garden is overrun with beans right now. Spanish cooks don’t usually use real saffron for their rice dishes, but a powdered yellow coloring. I like real saffron plus I add some pimentón (paprika), not smoked, for added color. A perol, made of rolled steel, is lightweight and easy to manage over a wood fire. In the kitchen, use a flat-bottomed wok or any deep skillet. The rice should stay meloso, juicy, rather than dry like paella. 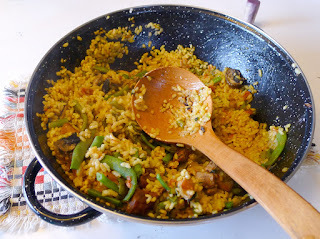 If possible, use Bomba variety of medium-short-grained rice, as it doesn’t “flower” and overcook as readily as ordinary paella rice. Córdoba wine, fino from the D.O. 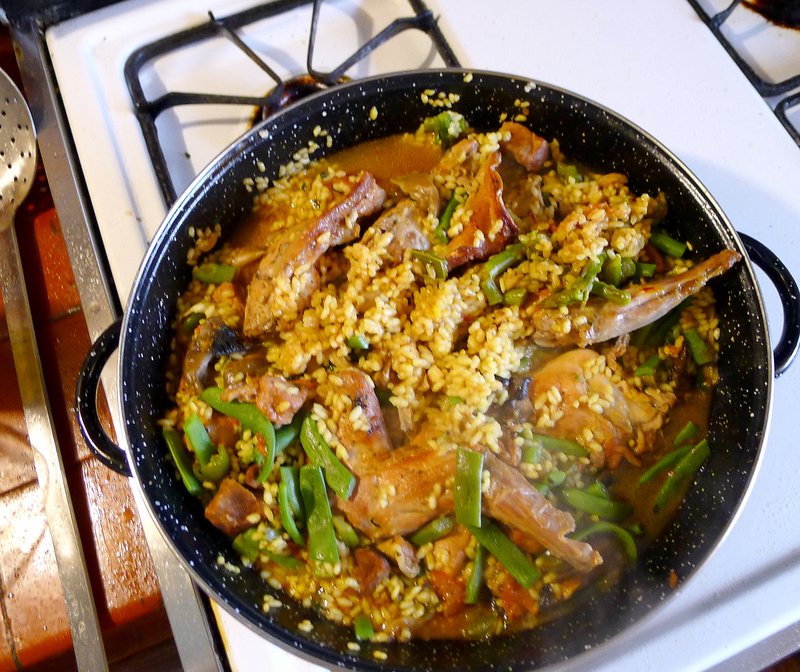 region, Montilla-Moriles, goes into the rice. If not available, use dry Sherry or white wine. It’s perfectly acceptable to drink Montilla right through the meal. Or, with rabbit, serve red, white or rosé! It's a "white" meat, farm-raised, so it's not gamy. 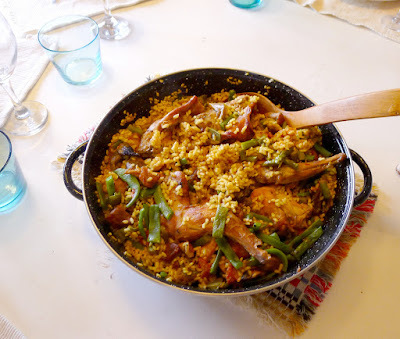 Rice cooked in a deep skillet, with rabbit, pork, mushrooms, beans and asparagus. Add the pork cubes, onion, mushrooms, green pepper, garlic and red pepper flakes, if using. Continue stirring and browning the meat. Add the tomato and continue cooking on a medium heat. Return the rabbit pieces to the pan. Add the herbs, asparagus and the fino wine. Bring to a boil, then add the broth or water. Bring to a boil and stir in the rice. Mix the saffron and/or yellow food coloring into 3 tablespoons of water. Dribble it into the rice and stir to combine. Cook on a high heat for 6-7 minutes. Then lower the heat and cook 14-15 minutes more, without stirring, until most of the liquid is absorbed and rice is done. Let set 5-10 minutes before serving. Thanks, I needed an idea for dinner tonight! David: Hope you enjoy arroz en perol. Well, I did a lot of substitution based on what I had on hand that evening. But I think I got the sense of the dish, particularly with substituting madiera for sherry. Wife and I both really liked it, it'll be a good dish when we want something a bit different from our usual fare. And it'll bring good memories of our time in Cordoba. David: Another thing I remember about October in Córdoba: highways with white fluffs of cotton along the edges of fields--season of the cotton harvest! What a great recipe! Can't wait to try it. If you ever get the chance to visit New Mexico, please let me know. I would love to introduce you to NM foods and this beautiful state. I no longer ask for green chili "on the side", just let them pour it on! Patty: Hope you enjoy the Córdoba rice dish. Thanks for the invitation to get to know New Mexico foods.